This is the story of Bond, a military war dog who served on more than 50 missions and three deployments to Afghanistan with his handler, Staff Sergeant Justin. (His last name remains confidential information due to the operational security aspects of both his unit and his position.) Via the auspices of the American Humane Organization, philanthropist, Lois Pope and the police department of Pine Mountain, Georgia, the two will now retire together and help each other bind up their still tender wounds. The two were inseparable during their shared time of service when they ate together, fought together and even slept in the same bunk. Military war dogs do not always know the joy of reuniting with their 'comrades-in-paws.' (See my article on Lucca: A Military Dog For All Seasons.) 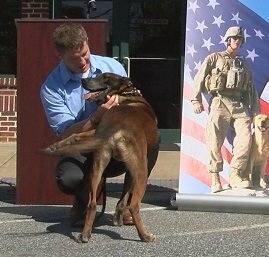 Since last year, the American Humane Society has privately funded the return trip home to 21 military working dogs and helped reunite them with their former human handlers. 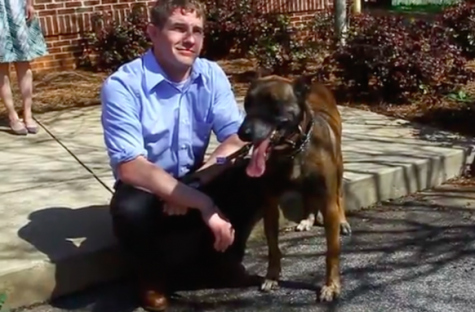 When Bond retired from the military last year, he became a K-9 Police Officer with the Pine Mountain, Georgia Polie Department. It was Staff Sergeant Justin's girlfriend, Sarah, who upon witnessing the pain he was suffering from his separation from Bond, contacted the American Humane Association, an organization that since its inception back in 1887 has been a friend to children, animals and the US military. "Bond has been Justin's comrade, companion and only solace at times, for years. I've watched him care for and love this dog like a pet and best buddy, for a long time. The one and only time I have ever seen Justin cry was the day he had to say goodbye to this dog. His reunion with military war dog (MWD) Bond is extremely important to him. Thank you to American Humane Association, Lois Pope and the Pine Mountain Police Department. You don't know how much this means to both of these heroes." "I want to let the American Humane Association, Lois Pope and the Pine Mountain Police department know that I am extremely grateful and cannot thank you enough. Words cannot describe how happy I am, and I know that if Bond could speak, he would tell you the same. Hey, he might even shake your hand! Three combat deployments together can truly forge a lifelong bond. This dog has been my best buddy during those times. It means a lot that I can now give him the relaxing life he has earned." With a heart even larger than her purse, Lois Pope, mother, grandmother and five-time New York City marathon runner, is one of America's leading philanthropists. Her financial support has been vital to the improvement of individual lives at local, national and international levels. Her generous aid flows through three distinct organizations; the Lois Pope Life Foundation,Inc; Leaders in Furthering Education (LIFE) and the Disabled Veterans' Life Memorial Foundation. "No one has sacrificed more than these brave military heroes on both ends of the leash. it is our duty now to make sure that these brave battle buddies are reunited and continue to benefit from the lif-saving connection that held them together though the thick of battle. 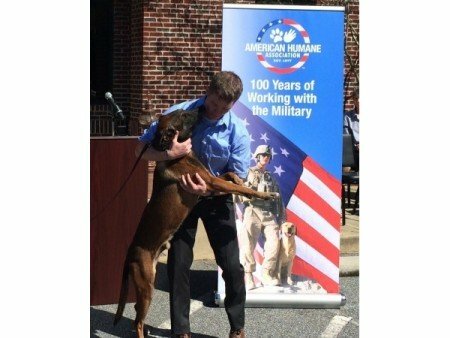 On behalf of the American Humane Association, I am proud to be a part of this remarkable effort to serve those who served us so well." Both solider and military war dog will need each other more than ever now. Staff Sergeant Justin must adjust to civilian life and Bond too suffers silently from the trauma of combat. The dog once knocked out his own teeth while struggling to chew himself out of a kennel during a thunderstorm. Service dogs save the lives of approximately 150 to 200 military soldiers on the battlefield by detecting IEDs and hidden weapons. (See my article on The Dog Who Took a Bite Out of Isis). Now the battle is on the home front and the enemy is PTSD. Allies of the heart are conjoined forever.